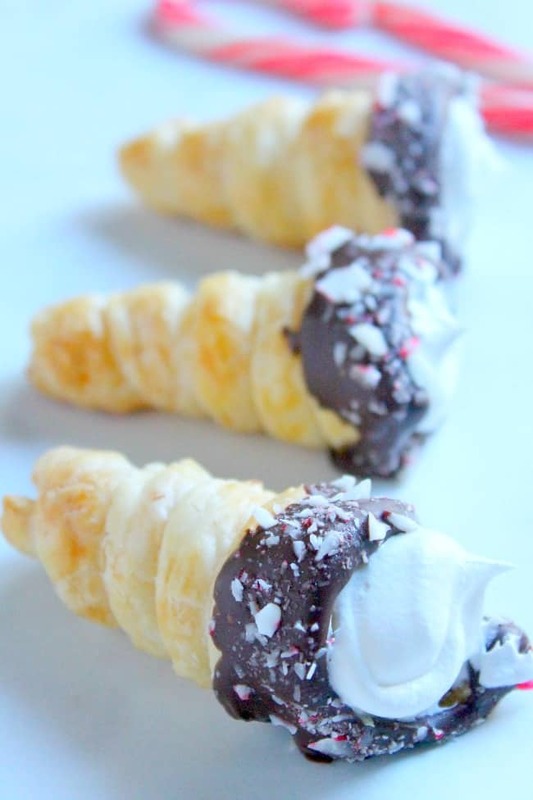 Chocolate Peppermint Cream Horns couldn’t be cuter! They’re perfectly festive, and so easy to make, too. 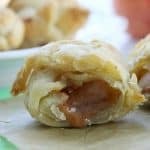 Made with puff pastry this is one easy dessert! When winter hits all I want to eat is peppermint. Why is that? I’m not sure. 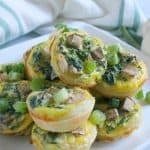 I know I can eat it all year long if I would like, but there is just something about eating it with hot chocolate and baked goods! Lots of us around the country last week got a blast of winter when snow decided to fall all over the South. Now that I am living in Minnesota the thought of snow doesn’t faze me much. The thought of a foot of snow is a little different story. While we were getting 2 inches so were areas in places like Louisiana. My sister lives there and I just laughed when she said that schools were closed. I get it, I know why they do it but now I know why those who live in the North laugh at those who live in the South when these things occur. So awhile ago I made you these Pumpkin Cream Horns, which happened to be a big hit with you guys. 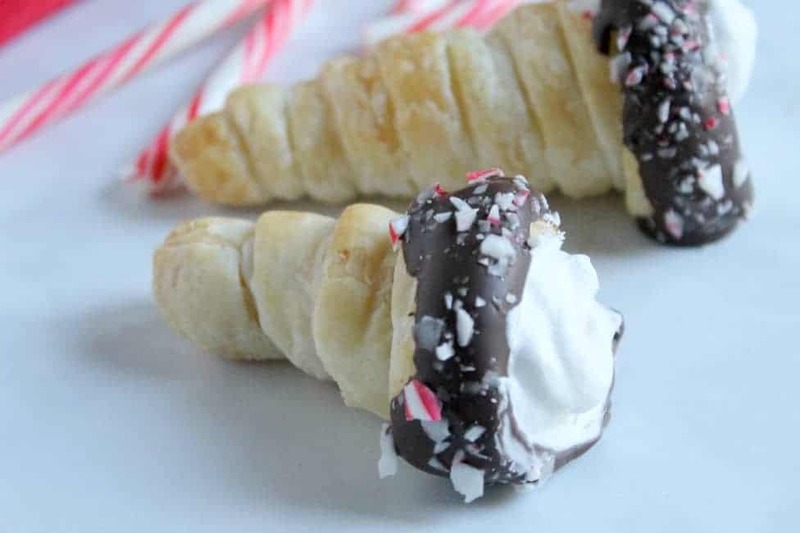 So this season I decided I would do Chocolate Peppermint Cream Horns. I decided to make the filling super simple because I was spending a little extra time on dipping the horns into chocolate. 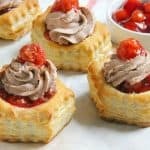 Now, I thought this would be a little tricky because I was not sure how the cooked puff pastry would hold up against melted chocolate. But it did just fine. I made these two times so that I could test out the dipping into chocolate technique to make sure I would get it right. The second time I had actually froze the horns after I made them because I knew there would be a few days before I was ready to complete these. I actually would not recommend freezing them or making them ahead of time. 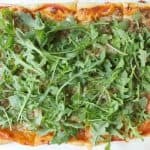 It changes the taste of the puff pastry. These are best if you make the pastry the day before or a few hours before you want to dip them into the melted chocolate. 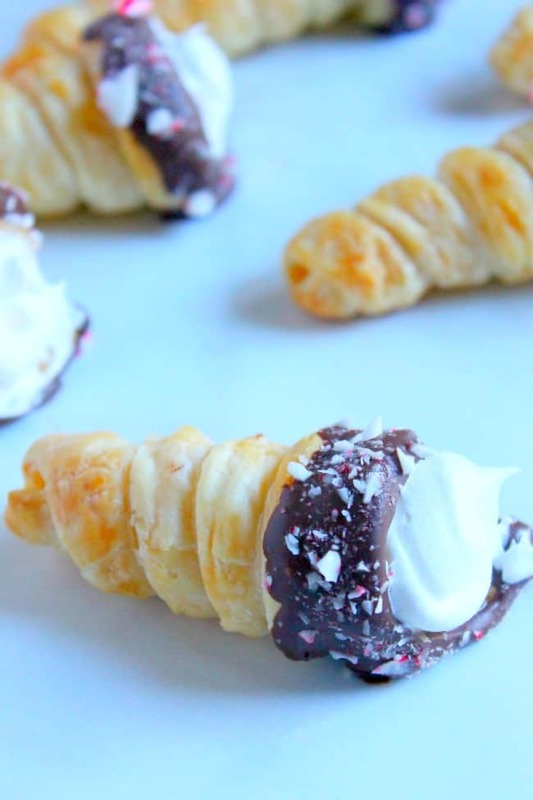 If you are looking for more chocolate and peppermint recipes how about trying these Chocolate Peppermint Thumbprint Cookies or these Chocolate Peppermint Croissants!